Prominent & Leading Exporter from Kolkata, we offer bi metal hole saw. Owing to our vendors state-of-art manufacturing unit and the usage of cutting-edge technology, we are able to present a comprehensive range of Bi Metal Hole Saw. Procured from some renowned vendors of the market, this saw is made available in several specifications and designed using advanced technology. Apart from this, our clients can avail this saw from us at market leading prices. 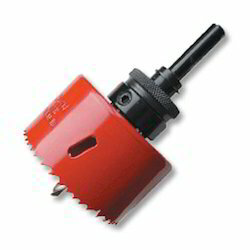 Looking for Bi Metal Hole Saw ?